Railway services resumed on Jhansi-Kanpur section after damaged tracks were replaced between Pukhrayan and Malasa stations. 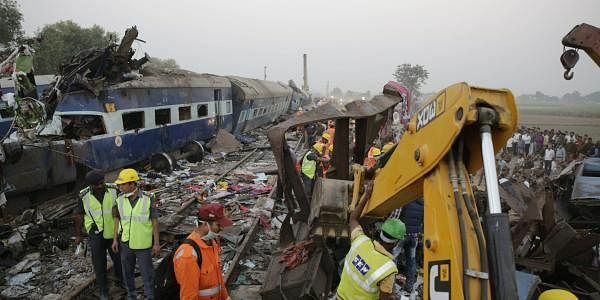 PUKHRAYAN (UP): The death toll today mounted to 148 in the Indore-Patna Express derailment here even as railway services resumed on Jhansi-Kanpur section after damaged tracks were replaced between Pukhrayan and Malasa stations. "The death toll has risen to 148 after fresh casualties were reported from the hospital. The deceased have not been identified yet," Kanpur IG Zaki Ahmed said. Some of the injured are still in a critical situation, he said. The Railway official said that besides replacing rails, electrical works were completed to ensure train operation on the busy route. After conducting the trial run, train services resumed today, the official said. "The route became operational last night after the damaged tracks were removed from the site. A trial run was conducted on the tracks before the resumption of train services," he said. A government helpline has been set up for the victim's families in Kanpur. Earlier, four trains were cancelled and 14 diverted after 14 coaches of the Indore-Patna Express derailed due to suspected rail fracture, disrupting traffic on the route. Officials had said that prima facie the cause of the accident could be due to track fracture. A high-level probe was yesterday ordered by Railway Minister Suresh Prabhu, who promised "strictest possible action" against the guilty. Making a suo motu statement in the Lok Sabha, he said a separate investigation will be held aided by latest technical and forensic analysis.